Error 650 Discussion Board If the fixes below didn't work... Post your problem / solution here!! Error 650 during installation or "Error occurred in the windows remote access software" with Windows 98. 1. Plug Modem directly into wall jack. Do NOT Plug into caller id box, answering machine, or other phone device. 2. Try a different phone jack in the house. If you have two phone lines, try the second phone line. 56k technology is not possible on this connection or is highly impared. Since line conditions can change from call to call, recommend to make several calls to test system to have accurate diagnosis.If you have multiple phone lines, try calling from each line. 56K failures are caused by analog to digital conversions in local phone lines. Check TCP/IP settings and DUN connectoid properties and verify if that all is correct. This issue can also occur if the Telephon.ini file is missing or damaged. 1.Click Start, point to Find, and then click Files Or Folders. 2.In the Named box, type "telephon.ini" (without quotation marks), and then click find now. 3.If you do not find the Telephon.ini file, skip to step 4. If you do find the Telephon.ini file, right-click it, click Rename, type "telephon.old" (without quotation marks), and then press ENTER. 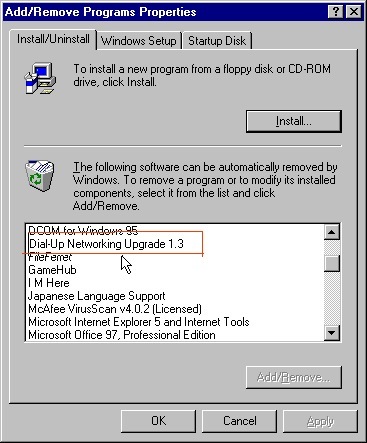 4.Quit the Find tool, click Start, click Run, type "tapiini.exe" (without quotation marks), and then press ENTER. Try adding 4 commas to the end of the number. This works sometimes because when connecting to an 56k pop their will usually be a beep noise that affects the modem, the 4 commas puts the modem in a pause state and will ignore the beep. Note: This solution may help, but will get connected at a very slow speed. Download the newest drivers from modem vendor.